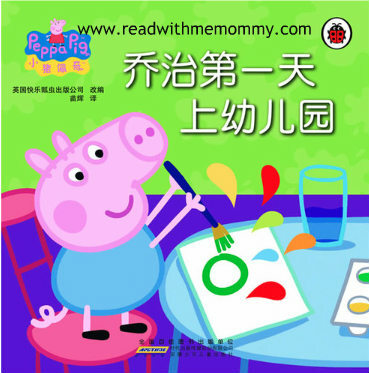 Peppa Pig comes in a set of 10 books. Peppa is a four year old little girl (erm.. piglet) who lives with her family including her naughty younder brother George. Through these cute little stories, enter her world, where she'll bring your little one through interesting encounters, experiences and adventures. 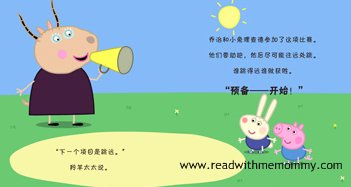 Children will love the beautiful illustration and cute storyline. It comes with relatively large fonts, but no hanyu pinyin. At the end of each book, there is English translation of the story. 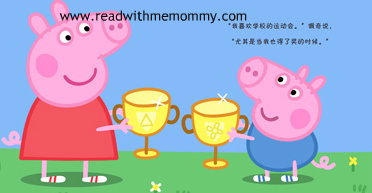 We would recommend the books for Peppa-pig lovers and children who are 3-7 years old.